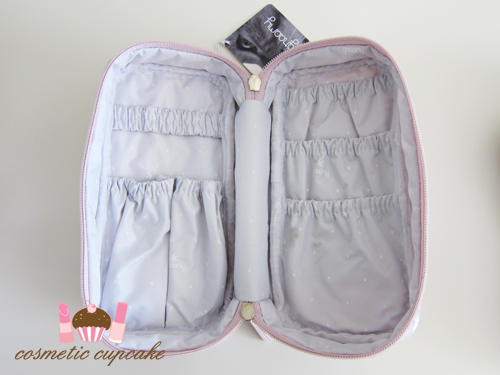 Cosmetic Cupcake: Groomy toiletry bags review + giveaway! 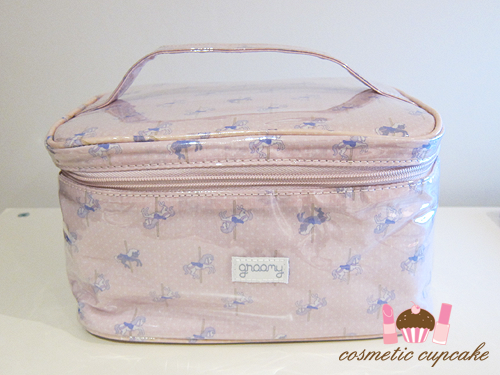 Groomy toiletry bags review + giveaway! Happy 2012 ladies! I hope you all had a fantastic New Year =) I don't know about you but I LOVE toiletry and makeup bags. I love organisational products (hence so many polish storage posts haha!) and I'm always on the lookout for new and improved ways to cart my beauty products around. So I was delighted when the lovely folks at Groomy offered me the chance to review some products. 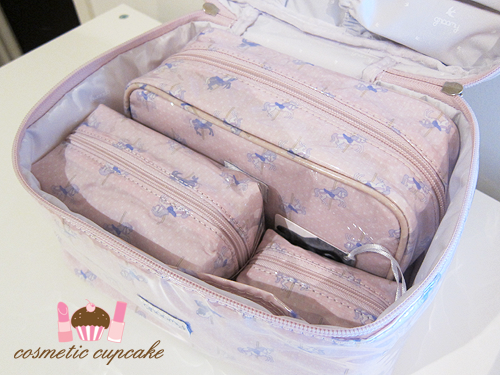 They very kindly sent me the very cute Carousel toiletry bag set to try out. Groomy travel products range from large makeup bags to tiny makeup pouches and come in three cute designs - Woodland, Carousel and Babushka collections. The designs are just SO ADORABLE!! They are just the type of designs I would be drawn to if I were to come across them in-store. 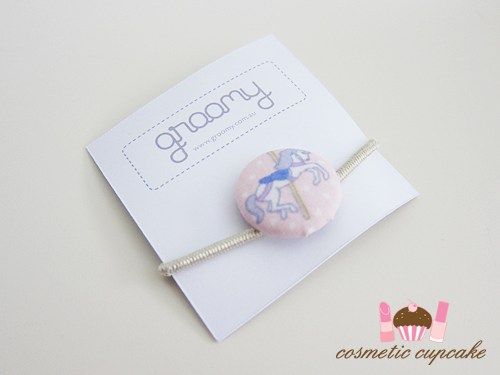 Besides toiletry bags, Groomy also make some lovely handmade items such as hair ties and shower caps. The Carousel toiletry bag set is a five piece set that contains the travel case toiletry bag, overnight toiletry bag, makeup pouch, mini pouch and beauty tool wallet. The different sized bags are fantastic as you can use them all together if you're travelling or separately for everyday. I keep the overnight toiletry bag at work at the moment as I've been going out a lot after work and need to do my makeup and it's the perfect size for some brushes, blush, highlighter, eyeliner and mascara. The bags are very sturdy and well made and are completely waterproof inside and out which is fantastic. Any spillages can be wiped down very easily! I love that there are so many different sized compartments inside for all your bits and pieces. The zippers are sturdy and the elastics are tight so nothing will move around when you're on the go! The prices are very reasonable starting from just $4.95 for the handmade powder puffs. There's even free shipping within Australia to sweeten the deal! You can purchase Groomy products from groomy.com.au. When Groomy very kindly sent me over the toiletry bag set to try out they also sent me some products to hold a little giveaway for my lovely readers!! I was hoping to have this as a Christmas giveaway but ran out of time so instead it's a new years giveaway =) What better way to kick off the new year! There will be THREE lucky winners! 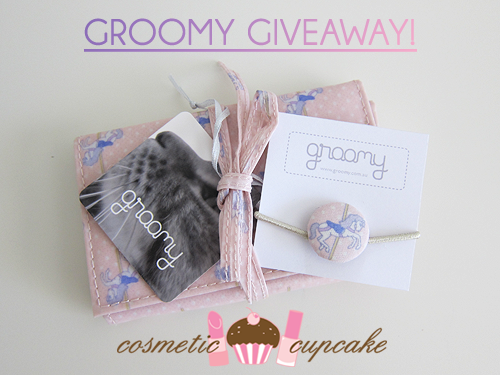 Each winner will receive a Carousel beauty tool wallet and Carousel hair tie. How to enter: Simply be a public follower of Cosmetic Cupcake via GFC and leave me a comment below with your GFC name and email address. You can earn an extra entry by tweeting about my giveaway with link to this post. Don't forget to @cosmeticcupcake and leave the tweet link in your comment! The products featured in this post were sent to me for consideration but this in no way influenced my review in any way. As always, my reviews are my 100% honest opinion. The products for the giveaway were also provided by the PR company. My Disclosure Policy can be viewed here. Looks like a nice package. The bags are so adorable! Happy new year 'Chelle! Do count me in please!These look too cute! I follow you with GFC and my email is freeeedz at yahoo dot com! These look really nice, not to mention how convenient they must be. Thank you for the giveaway and Happy New Year! So cute I really love the hair tie. Wow..this is cool!! Would love to win this. love the bag!! also the design look so cute! 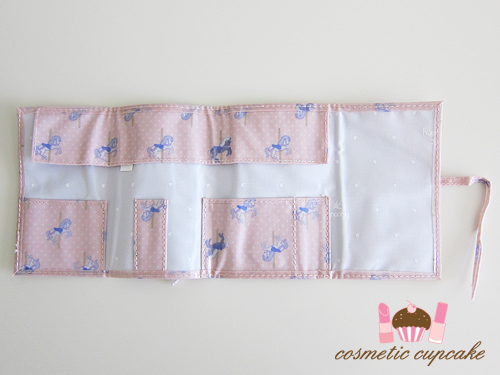 The carousel pattern on these toiletry bags are soo pretty! this is su coute and handy!! Happy New Year! The Carousel design is too cute! Thanks for starting this year so nicely! Ohhh! This is so cute! Hola!! un premio muy encantador, participo!! Gracias por la oportunidad! Besos!! very cute print. Love to see it in person. I'm a GFC follower Lilpil. And you already know my email.. I just stumbled across your blog when I was looking for nail polish storage options and I just love it. This giveaway is really cute! Can't believe I almost missed this giveaway! Nice name for a blog. Thank you for this give-away! Joining,the bag was so cute! i've followed your blog. and this is my GFC name: Nila Kussriani. I'm going on a summer holiday..
A Christmas swap with Aysh!